Week Ten – Eat More Fish! This week I made a commitment to eat more wild-caught fish and seafood with the majority of it being fatty fish that are high in omega-3 fatty acids. Living on the coast of Maine, surrounded by fishermen and lobstermen, we probably eat more seafood than the average American, but after all the research I have done during the past couple of weeks, I plan on increasing that amount even more. I am committed to a minimum of 2 meals of high omega-3 fish per week but plan on serving some sort of seafood more often. 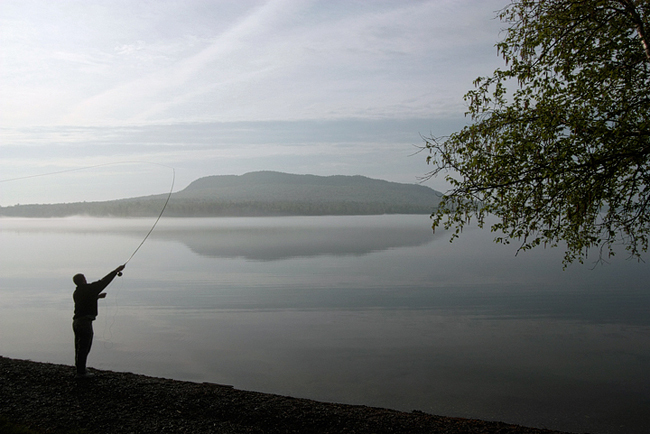 My son fly fishing at Moosehead Lake in Maine. I will be writing a few posts over the coming days that will attempt to explain in laymen’s terms exactly what omega-3 fatty acids are, how they differ from omega-6’s, and how this change alone could make a huge improvement in your health and mine. Increased omega-3 fatty acid intake (specifically DHA and EPA) has been linked to lower risks of heart disease, Alzheimer’s, and some cancers; it has also been linked with lower blood pressure, lower triglycerides, higher HDL, and greater cognitive function among other health benefits. Today you may have to take my word for it, but stay tuned and read the upcoming posts. 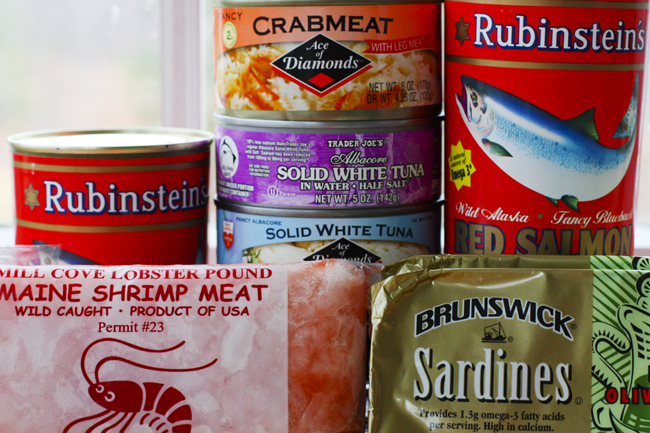 I buy fresh fish once or twice a week, but I keep these on hand for quick meals. Currently the recommendation of the American Heart Association is 2 servings (3.5 oz. or 100 grams each) of omega-3 rich fish per week for a healthy person with no history of heart disease (although others recommend two larger servings of 6 oz. each per week). They encourage those who have a history of coronary heart disease to increase their fish or fish oil intake to daily. What are the best fish to eat? Among the highest in omega-3’s are Atlantic mackerel, wild salmon, tuna, trout and sardines. In addition to these blue mussels and oysters are high in omega-3’s while shrimp and some species of crab have lesser (but still significant) amounts. I will speak to this in greater detail in a future post. I’ll also discuss the issues of wild vs farmed fish and fish oil supplements vs the real thing. In the meantime, what are some of your favorite recipes for cooking seafood that is high in omega-3 fatty acids? Please share them in the comments! This is part 10 in the series 52 Weeks of Health. If you are just joining us you may want to start at the beginning. OK, get your fishing license now ! This has more carbs than you might want I suspect, but it is our favorite way to have salmon. It involves another local product – maple syrup! 2 Tbls of soy sauce. Place salmon in dish, cover and let marinate for 30 minutes, turning once. Bake at 400 F for 20 minutes. We eat this over wild or brown rice and spoon a bit of the sauce over it. Yum! It sounds delicious, and though it is a little too high in sugar for us I may try cutting back on the maple syrup by half and give it a try. Thanks for the recipe.